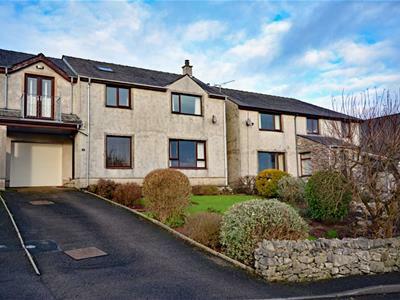 The property has a well sized driveway with sufficient off road parking available for 2/3 vehicles as well as an integral garage. The water metre is also located on the driveway. The front garden is neatly landscaped with mature borders and a stone wall at its perimeter. A flagged pathway gives access along the front and to the side aspect of the home. Dashed with mahogany front with styled UPVC double glazing, the front door is accessed underneath the overhang giving shelter when opening the door. This opens up directly into the entrance hall. 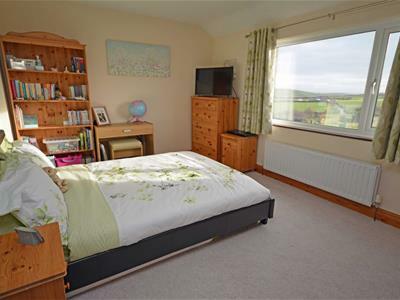 There is a large window allowing for plenty of natural light and to enjoy its field side views out across Stainton. A Farrow & Ball neutral decorative display with a wood stained spindled staircase, door frames and skirting. There is a cornice and an open archway flowing into the kitchen. 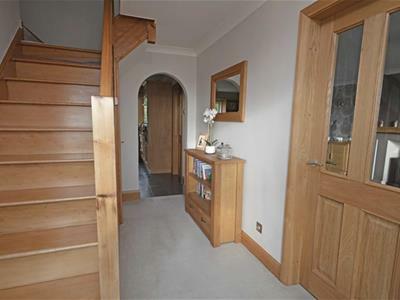 There is a useful understairs storage cupboard, a door to the ground floor cloaks/WC and a doorway to the Lounge. There is a double panel radiator and power points. 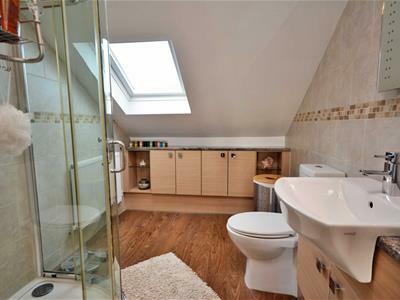 This room is fitted with a two piece suite consisting of a low level WC and wash hand basin with a tiled splashback. There is an Icon airflow extractor unit with double panel radiator and wood laminate floor coverings. 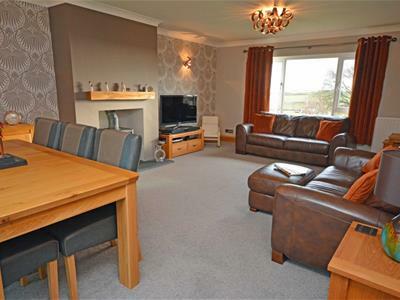 A beautiful family lounge with excellent natural light and stunning views. The broseley multi fuel burner sits on a large Burlington slate plinth with a floating oak beam. The Farrow & Ball decoration compliments this centre piece. There is a cornice, two double panel radiators, power points and a satellite feed. 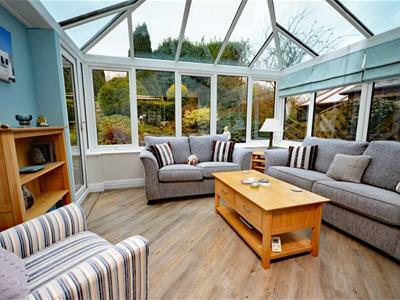 There are doors to the hallway and kitchen as well as access through to the conservatory. There is a UPVC double glazed window to the front aspect and UPVC sliding doors to the rear aspect giving access to the conservatory. All glass ceiling ( Pilkington self-cleaning glass ) with UPVC double glazing to the rear aspect and side aspect. 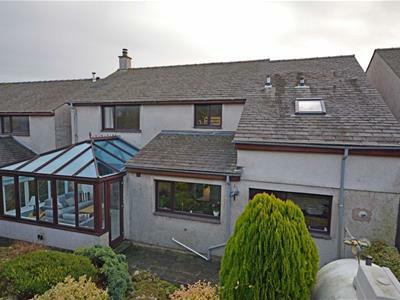 A single clear UPVC double glazed door gives access through to the back garden and patio area. A great additional space that's light and bright. Karndean floor coverings with sky blue and white walls, wall lighting and power points. Enjoys a nice back garden view. 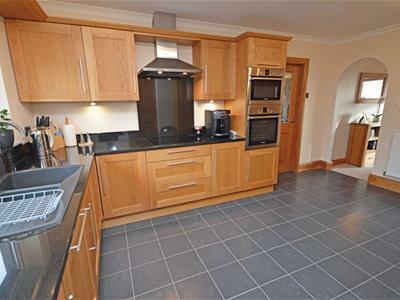 A fabulous modern soft close shaker style kitchen with solid oak doors and a good mix of base and wall units. Plenty of counter space on the solid black granite tops with a matching recess and down lighting. 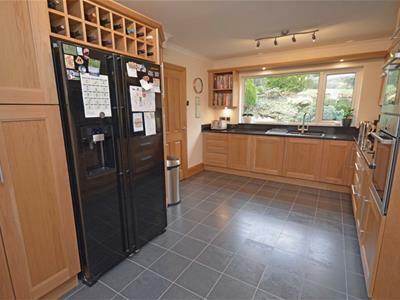 Built in appliances to be included in the sale are: a double Bosch oven and microwave (electric fan assisted with self clean to main oven) a four ring Bosch induction hob, Hotpoint cooker hood with light and fan and an integrated full size Beko dishwasher. There is a recess for an American styled fridge freezer with plumbing for a water supply. There is a granite 1.5 bowl sink with mixer tap. There is a tiled effect laminate style floor with a double panel radiator and power points. There is an open archway to hallway and a doorway leading through to the lounge and utility room. There is a UPVC double glazed window to the rear aspect. 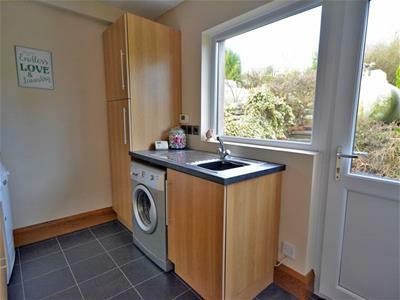 This is accessed just off the kitchen and has a space for a washing machine with plumbing and a tumble dryer recess. There is a single bowl stainless steel sink unit and counter top in a black laminate. There are oak style base and wall units for storage with one housing the serviced Vaillant combination boiler. There is a continued tile effect laminate floor with a doorway leading to the integral garage. There is a UPVC double glazed window to the rear aspect with a double glazed door to the rear aspect. Spindled stairs lead up to the first floor landing from the entrance hallway. 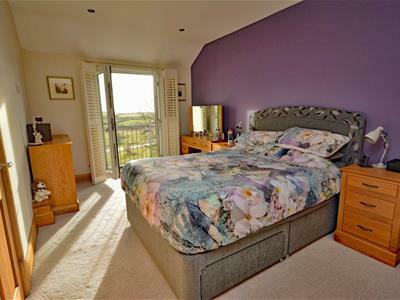 There are UPVC double glazed french doors to the front aspect with fitted shutters and access out on to the balcony. 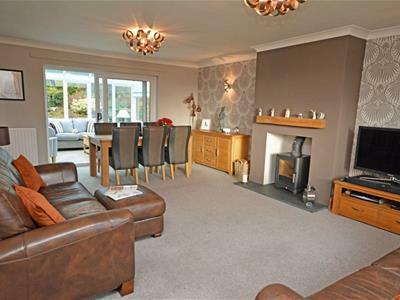 This immaculate new master sits to the extended side of the home. Benefitting from an en-suite and built in wardrobe. 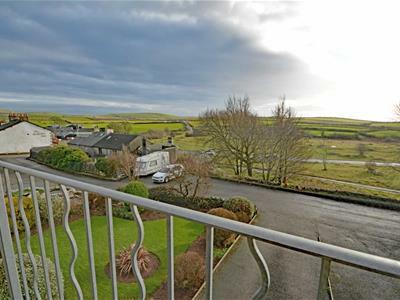 Take in the panoramic view out across the surrounding fields and over to the bay. 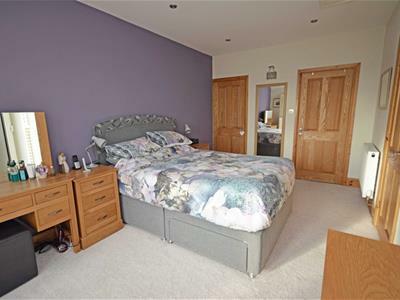 A soft plum feature wall with light egg shell and wood stained skirting, architrave and doors. LED spot light ceiling with a TV point and power points. There is a double panel radiator. Modern fitted three piece shower suite with thermostatic rainfall corner shower unit with self draining base and sliding doors. The room has a built in vanity unit with cupboards and a wash hand basin with mixer tap as well as a wall mounted LED mirror. There is a dual flush low level WC. Luxe vinyl tile in an oak style with a double panel radiator, spot lighting and extractor. The original master double prior to the extension. 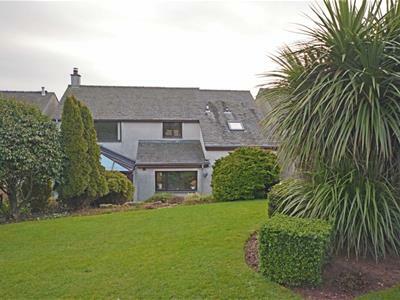 This also takes in a stunning front view across to the bay. The room is decorated in pastel shades of sage and antique cream. 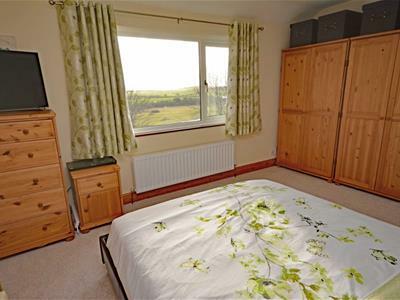 There is plenty of space for bedroom furniture and has a double panel radiator, power points and TV aerial. There is a UPVC double glazed window to the front aspect. There is a UPVC double glazed window to the rear aspect with fitted blinds. 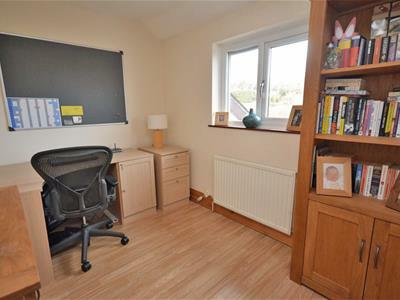 A well sized fourth bedroom currently used as a home office. This would make an ideal nursery, study or guest bedroom. 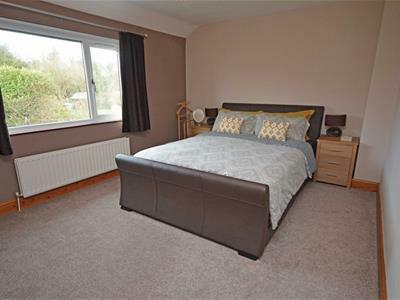 The decor is light and neutral with wood laminate floor coverings, a double panel radiator, power points and a telephone socket. 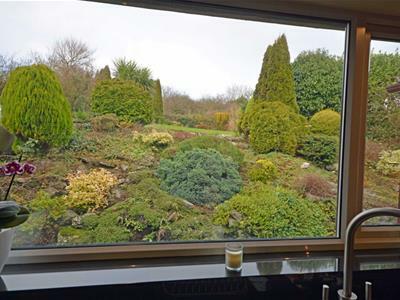 This room enjoys rear garden views. This is a wonderful four piece suite with a corner thermostatic shower unit, with self draining base. There is a low level bath with mixer tap and shower head with side and end panel. There is also a low level WC and a built in wash hand basin on a tiled vanity unit with a cupboard store and mirror with shaver points. There is a frosted UPVC double glazed window to the front aspect. The garage has remote control electric roller doors as well as light and power. It is integrally connected to the utility room. 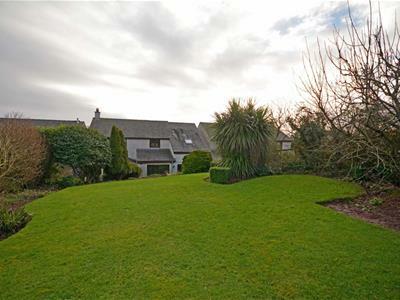 A charming landscaped rear garden spread over two tiers. The lower tier has a flagged patio and pathway with a stepped rockery and mature border giving access up to the main lawn. Surrounded by trees, shrubs and bushes this colourful display can be enjoyed as a sunny aspect with good privacy.